The icon is the word of God transfigured by prayer. It begins with prayer and becomes prayer during the time of its being written. It is blessed and transfigured by being the silent witness to the prayers, confessions and venerations of the faithful. The icon is not a mere picture or work of art. It is a window into the realm of the spirit. It is the spiritual door through which our prayers rise like the sweet scented smoke of incense to the saints and our Lord God in Heaven. That is why there are miracles attributed to some icons and miraculous events associated with others. The Hand of God has reached down and blessed them to reveal their transfiguration to the world! The iconographer understands that he/she must be an obedient and faithful servant. This work requires prayer and fasting. The servant is only an instrument by which means the icon is written, for everything is a gift from God and nothing is possible without His blessing. For this reason the icon can only be truth. There can be no invention. Such fantasies and lies have no place in iconography. Care must be taken even with the materials for in all its parts the icon represents God's creation: animal, vegetable, and mineral. The iconographer must guard against vanity and pride, for it is only by the path of humility and meekness that God will illumine the soul and bless the hands so that a truly good and sacred icon may be written. There should be an icon in every Christian home. Just as we honour and show love for our family and friends by having pictures of them in our homes, we should show love and honour for our God and saints by having one or more icons in our homes. 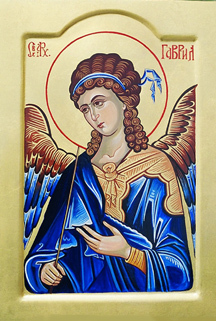 At least one icon of the patron saint or our Lord Jesus Christ or the Most Holy Mother of God should be placed on the east wall of the dining room or living room. There it will invite us to pray, remind us of our Christian duty to love God, our family and neighbours, to be charitable, forgiving, and helpful to others. Surely in this sinful world with all the misfortunes, troubles and suffering, there can never be too much prayer or love. It is God's love and mercy that protects and saves us and His holy angels who are constantly at our side.